Many times we have mentioned how much pleasure we take in welcoming new artists to the Earth Mantra family. Today is such a day, as we welcome Mark Cotton and his Another Neglected Hobby project, releasing his stunning brand new album Chaco Equinox. Mark's inspiration for this recording came from watching a documentary about Chaco Canyon in northern New Mexico, USA, which told the story of the buildings and roads built by a civilization of early Native Americans between about 900 and 1150 A.D. Archaeologists have discovered several landmarks within the complex of pueblos there, landmarks that seem to have been built to track the sun and the moon through their cycles. One such landmark is a petroglyph in the shape of a spiral, carved into the face of a butte behind three enormous slabs of rock standing on end. Light cast by the sun and the moon is filtered by openings between the slabs of rock to fall on specific spots on the spiral petroglyph during the spring and fall equinoxes. Many of the structures built by the Chacoans are situated in perfect alignment with the midday equinox sun. This magnificent recording captures the sense of discovery and wonder that the builders of those impressive structures must have felt when they first realized they were able to predict the journey of the sun and moon through the heavens. Aside from astronomers, very few of us have a close relationship with the sky and its constantly-shifting vistas. No matter where on Earth we might be, the sky is an ever-changing tableau of light and color. During daylight the sun slowly arcs across the sky, taking a slightly different path each day, sometimes hidden from view by a myriad of cloud formations that never appear the same way twice. Then night slowly drains all but the most intense pinpoints of light from the sky and those pinpoints do their own dance, spinning around Polaris, the one star that seems to remain motionless, while the moon follows its own unique course. How different life must have been for the Chacoans whose lives were so centered on the sky. Certainly an ambitious theme to attempt, and Mark has achieved his goals brilliantly. The music of Chaco Equinox can be described as an extensive tone poem, a cinematic snapshot of a mysterious culture long past, huge imagery and concepts lovingly captured in a timeless long form ambient composition. Truly visual music like this is difficult to describe accurately in words, so we will simply direct our listeners to give this album a spin, particularly in a darkened room with headphones. Those who listen to the piece end to end will experience a powerful and evocative journey through the ages, eternal red rock presiding silently over the passage of time immemorial, ancient civilizations rising and falling beneath the blazing night sky, philosophers of antiquity peering upwards at the cosmos, straining to understand the ineffable. Truly imaginative work by an artist that we think our audience needs to know better. 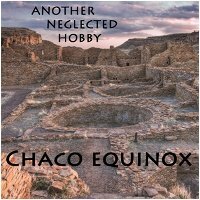 So it is our great privilege to welcome Another Neglected Hobby to Earth Mantra, and encourage all our listeners to download and enjoy Chaco Equinox. A glorious work of ambience that we cannot stop listening to. Highly, highly recommended.